Bitcoin Mining Calculators To Help You Calculate Returns! Bitcoin mining is a dynamic industry with consistent updates to the hardware, software, pools, price, difficulty and profitability, making it harder to always make money mining. From the early days of CPU and GPU mining, investors have switched to ASIC miners to increase their network share and mining profitability. Bitcoin price today also impacts the industry by increase the incentive for new miners to set up mining rigs. But things get complicated when you don’t have insights into how much profits you can make from mining. But this is not our main topic today…. The cost of electricity plays a significant role in your profitability. Let’s assume you have zero power cost and you are mining a handful of Bitcoins every day. In this highly unlikely scenario, you’re definitely going to end up with a profit with no costs to bear! And profit is what investors seek to make when they start Bitcoin mining. For this, the Bitcoin community has several online calculators that can help you get an insight into your expected monthly or even daily profits. But you still need to do some calculations on your own (such as estimating cost per kWh in your locality). Here are the popular Bitcoin mining calculators that you should give a try before firing up your ASIC hardware. This mining calculator is my favorite mainly because of its user-friendly interference. The calculator has several options and computes profitability in real-time. It is a powerful mining calculator that works with several API’s to help you get better insights. In addition, the calculator also takes into account the network hashrate and mining difficulty while performing calculations. You can easily fill the relevant fields such as Cost per kWh, Power consumption and Hashing power of your ASIC machine. Further, breaking your profits in the day, week and month can give you a better understanding about the expected return you are going to make. The calculator also features the option to add pool fees which increases the accuracy of your calculations and provides near-accurate profit/loss calculations. How about giving a try to this graphic friendly CryptoCompare calculator here and get to know more about your potential revenue and profits? Using the calculator is very simple and you just need to fill it with the relevant details which can be seen in images. 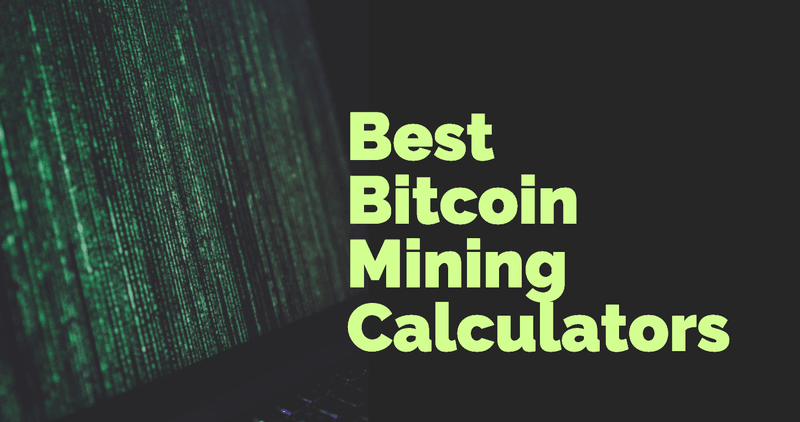 As the name implies, this machine is one of the best helpful when it comes to Bitcoin mining calculators. The calculator is designed with every aspect possible of the mining industry. And it even has features to input the likely rejection rate of hashes your ASIC miner might perform. Remember that mining all your shares are not accepted as some might become stale and are rejected, reducing your machine’s efficiency. When it comes to MyCryptoBuddy calculator , an in-depth assessment is done by the developers to take in to account all possible scenarios that can increase the cost for investors. In addition, there is also a long-term projection calculator that can come handy if you are looking to invest a lot of your savings in Bitcoin mining. With options such as recurring cost and selling profile, this calculator well suits the needs of experts and even mining industries. But there is more when it comes to MyCryptoBuddy mining calculator. The website features an impressive graphical interference based on your data. It also has options to add expected percentage changes to Bitcoin mining difficulty and the price. Once plotted, the website presents a line chart with anticipated profits or loss giving better insights into your mining operations. With several options, it might be hard for beginners to understand and use this calculator. But if you are serious about Bitcoin mining, then you should give this calculator a try. To use the calculator, insert your ASIC miner hashrate, your power cost, pool fees and expected rejection rate. The calculator will automatically draw a line chart based on your input. NiceHash is a renowned company when it comes to Bitcoin mining. It is a great place for miners to buy and sell their hashing power using Bitcoins. In addition, you can also connect your ASIC hardware to their website and use their mining software for minting new Bitcoins. Their calculator (available here) is an easy way to start with Bitcoin mining. All you have to do is to choose your hardware from a range of ASIC miners and your power cost per KWh. Besides, there is also an option to switch currency from USD to your preferred one. Once you hit Calculate, the results will be generated based on your inputs. In addition, you can also choose the number of devices you have for Bitcoin mining. Perfect if you have multiple ASIC miners to work with. To use the calculator, switch off the CPU and GPU options since you won’t need them (unless you are not that serious about Bitcoin mining). Bitcoin mining with CPUs and GPUs are long dead and if you are planning to use them for generating profits, you are not going far. Choose your ASIC miner from the dropdown list. In case, you are not able to find one, then it only means it is obsolete hardware and is likely going to incur you a loss. After choosing your ASIC miner, enter the expected power cost and hit calculate for the calculator to work. You will likely to know if it is profitable to mine Bitcoin using your current hardware or whether it needs an upgrade. When it comes to simplicity, 99Bitcoin mining calculator beats most of its rivals. It is a very simple two-step Bitcoin mining calculator that takes into account several options, such as changes in Bitcoin price, pool fees, and hardware costs etc. You can adjust almost everything in this calculator. It even includes changing in mining difficulty and block reward that most calculators don’t allow for. These changes might not be significant for many miners, but those who are in this for the long haul will find this calculator handy. How about adjusting Bitcoin block rewards and expected Bitcoin prices in the next year while modifying mining difficulty? Surely sounds like a great mining calculator if you are a long term investor! In addition, the calculator also has built-in features to give you an overview of expected Return on Investment (ROI) for the year. This can be crucial for miners looking to break even at an early stage. For using the calculator effectively, you can begin with the basic option. If you know nothing about pool fees or hardware cost, you can just leave them blank. It is a simple calculator and only requires an input of your ASIC miner hashrate to work. Last but not least, here’s another simple mining calculator that tops the charts with its user-friendly GUI and ease of use. Their website also useful if you are looking for various pools to start Bitcoin mining. With the option to add pool fees and hardware cost, WhatToMine Mining Calculator gives you a better picture of your expected profits. And the website also estimates rewards distributed in an hour, a day, week, month and a year, which can be helpful for many investors who would like to know how much they can make per hour, for example. Using this calculator is easy (which is one of our top criteria when reviewing calculators). You just need to provide your ASIC hashrate, cost per kWh and the pool fee to begin. In addition, you can also provide your hardware cost to have a better understanding of your ROI. There are many Bitcoin mining software that you can choose from. It entirely depends on your mining hardware as well as your interest in Bitcoin mining, whether short-term or long. If you are looking for some short term gains, then Cryptocompare or Nicehash calculator would be the perfect match. But in the long-run, MyCryptoBuddy Mining calculator would be the best fit. In the end, choose your kWh per hour wisely before using any of the calculators above, since it can heavily impact your profits.